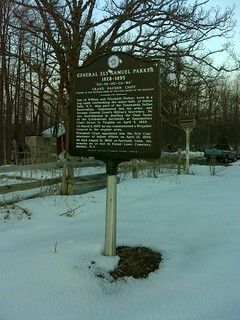 The Tonawanda Reservation is located in Genesee County in Western New York and not far from the towns of Batavia, Elba, Oakfield, and Alabama. When I was younger, my father would sometimes take us on Sunday drives through the area and stop off at The Rez to fill up the gas tank and buy stuff from the store. It's been a long time since I'd been there and their gas station has definitely been upgraded since then. If I remember correctly, they weren't a self-serve the last time we were through there, around 1998. It's strange, thinking back, how even these little experiences have formed who I am. 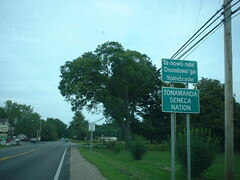 Anyways, back on subject, the Tonawanda Reservation is settled by the Tonawanda Band of Seneca. Being federally recognized, they live by their traditional ways of governing. The treaty, which made them federally recognized, was the "Treaty with the Tonawanda Senecas." It was signed on November 5th, 1857, Ratified on June 4th, 1858, and Proclaimed on March 31st, 1859. 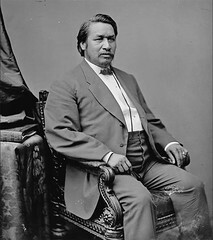 Charles Eli Mix, Commissioner of the Bureau of Indian Affairs at the time, represented the U.S. government and representing on behalf the Tonawanda Band were Seneca attorney and diplomat Ely Samuel Parker (Ha-sa-no-an-da), George Sky, Jabez Ground, Isaac Shanks, and Jesse Spring. Along with the treaty and being federally recognized, the land sales of the Treaties of Buffalo Creek were effectively reversed for the tribe and they were able to buy back the lands taken and sold by the Phelps and Gorham purchase. The Tonawanda Reservation is along the region where the border of the neutrals lived back before they were wiped out during the Beaver Wars. The first tribe to take a hit from the Iroquois (specifically, the Seneca) were the Wenrohronon. They suffered mass casualties in the attack, had their land taken and were forced to flee to Huron lands. It's hard to find any information about the Wenrohronon, as their tribe was absorbed and lost to time. These attacks by the Iroquois were carried out due to the influence of the Dutch in trying to disrupt French trading. Little by little, the lands of the Tonawanda Reservation are being sold to surrounding interests. Though, it's said the Tonawanda Seneca are more lenient in allowing land to be sold to non-natives, in comparison to other bands of Seneca in the region. In 2015, the population was 458 but that number may not be accurate. 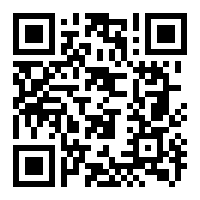 In 2010, according to the Census, there were 693 residents.